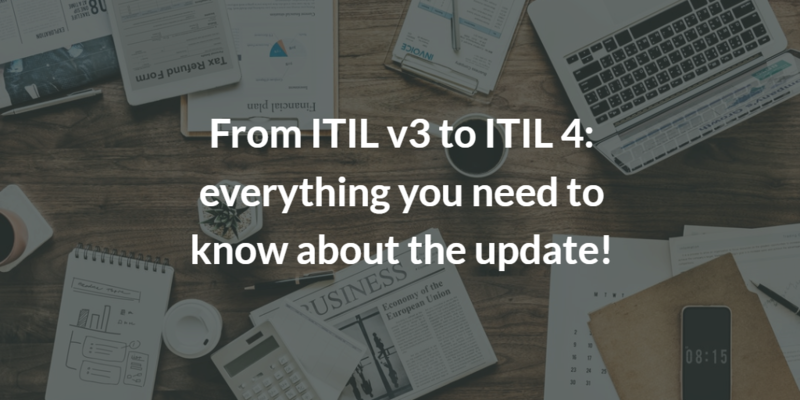 Home/From ITIL v3 to ITIL v4: everything you need to know about the update! From ITIL v3 to ITIL v4: everything you need to know about the update! The ITIL® Best Practice framework is widely recognized to be the most enabled IT best practice which provides a common language and tools that power collaboration within IT teams, to deliver value across the business. Axelos, with the collaboration of field expert, decided to move a step forword to adapt the ITIL framework to the new IT business challenges. ITIL 4® was launched in 2019 and it helps businesses to navigate the new technological era, commonly known as the Fourth Industrial Revolution. From 28th of February all the ITIL Foundation trainings organized by QRP 2019 are updated to ITIL 4 version. The level ITIL Expert is delated. ITIL V4 Foundation was launched on 28 February, 2019. We have organized a free webinar focalised on the update: our trainer Kaïs Albassir will explain all the changes between ITIL v3 and ITIL 4. The webinar is scheduled for March, 12 at 12:30. Save the date and subscribe by following the link: webinar “From ITIL v3 to ITIL 4: everything you need to know about the update”.